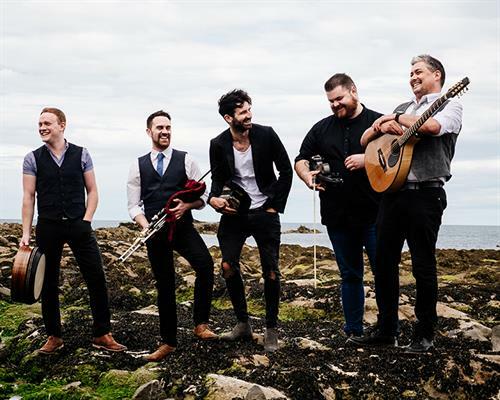 Gesa Power House Theatre presents Celtic/Irish band Ímar on Sunday, March 17 (Saint Patrick’s Day) at 2:00 p.m.
Adam Brown (bodhrán), Adam Rhodes (bouzouki), Mohsen Amini (concertina), Ryan Murphy (uilleann pipes) and Tomás Callister (fiddle) share a strong background in Irish music – although only Murphy actually hails from Ireland; Rhodes and Callister are from the Isle of Man, whilst Amini is a Glasgow native, and Brown originally from Suffolk. These foundations underpin many of Ímar’s distinctive qualities, in both instrumentation and material. Ímar’s unmistakable synergy, however, centers on the overlapping cultural heritage between Scotland, Ireland and the Isle of Man. All three places once shared the same Gaelic language, and a similar, clearly potent, kinship endures between their musical traditions. Reserved seating tickets ($28) will go on sale on Thursday, January 24, online (www.phtww.com) or by calling the box office at 509-529-6500. For group ticket sales, please call 509-876-1662.